The Full Floating 10.5" Ring Gear Model. Rated at 7,000 pounds carrying capacity. 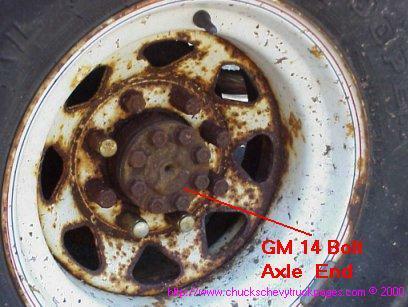 HERE IS A CLOSE-UP OF A 14 BOLT GM REAR END. IT IS IN A 1977 CHEVY K/20. IT IS A FULL FLOATING AXLE, WITH THE MASSIVE 10 1/2" RING GEAR. THE AXLE SHAFTS ARE HELD IN WITH BOLTS. THE SMALLER 14 BOLT, WITH IT'S 9 1/2" RING GEAR, IS A SEMI-FLOATING DESIGN. IT USES C-CLIPS TO HOLD THE AXLES HAFTS IN. JUST LIKE THE 10 BOLT, AND 12 BOLT GM REARS. THIS MEANS IF YOU SNAP AN AXLE SHAFT, YOU COULD LOSE A REAR WHEEL, IF YOU WERE TO DRIVE THE VEHICLE THAT WAY. SNAP AN AXLE WITH THE FULL FLOATING DESIGN, AND IT STAYS ON THE VEHICLE.